A Mozilla developer working on the next release of Firefox has created a test build of the next-generation browser that anyone can download—and the new styling, knows as Australis, features curved tabs which make it look just like Chrome. In fact, in Mozilla's new browser it's only the active tab which is rendered as a curved tab—the rest disappear into the background. 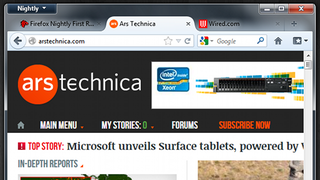 But there's no denying that Mozilla has taken Chrome's most distinctive graphic element and run with it.